Learn how free software became open source and how you can sell open source software. This book provides a historical context of how open source has thoroughly transformed how we write software, how we cooperate, how we communicate, how we organize, and, ultimately, how we think about business values. You’ll look at project and community examples including Linux, BSD, Apache, and Kubernetes, understand the open source development model, and how open source has influenced approaches more broadly, even proprietary software, such as open betas. You'll also examine the flipside, the "Second Machine Age," and the challenges of open source-based business models. Today, open source serves as shorthand for much broader trends and behaviors. It’s not just about a free (in all senses of the word) alternative to commercial software. It increasingly is the new commercial software. 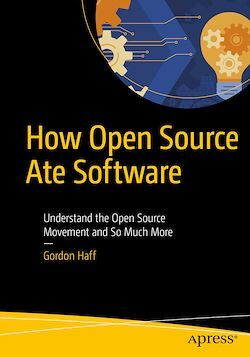 How Open Source Ate Software reveals how open source has much in common, and is often closely allied, with many other trends in business and society. You'll see how it enables projects that go beyond any individual company. That makes open source not just a story about software, but a story about almost everything. Apply open source principles more broadly to openorg, devops, etc. Anyone who has an interest in what is happening in open source and the open source community, and anyone who is contemplating making a business that involves open source.